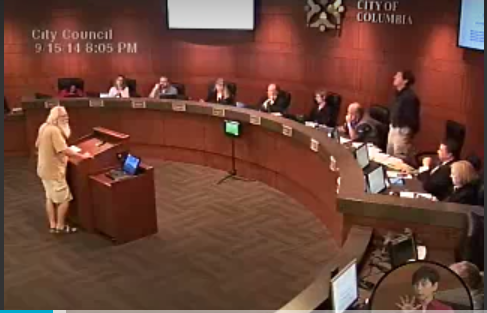 COLUMBIA, Mo 12/9/17 (Feature) -- Columbia City Council meetings can be nerve-jangling affairs. Dry mouth, stammering, and sudden loss of thought are among the hazards speakers endure before the dais of power. Which is why I marveled at Dan Cullimore's Council testimony (photos). Smooth, eloquent, brief, and on point, his communication style was a wonder to behold. Dan died Tuesday from pancreatic cancer. I knew him from his civic activities, and thought recalling the many times he went to bat for his fellow citizens at City Hall a good way to remember him. As you read his own words and paraphrased summaries from City Council meeting minutes, you'll see the man friends and even foes saw: wise, well-versed, capable, passionate, fair, an out-of-the-box thinker who often put his personal needs aside to serve a bigger picture. Before the Columbia City Council, Dan Lee Cullimore was a man of the People. "Thank you very much for all the time you’ve spent on this. My name is Dan Cullimore. I know this has been very difficult. "You hear a universe of opinions. I have changed mine since the last public hearing. I came to that hearing in support of Trial B; I no longer support that. I am much more in favor of Trial E, mostly because it is most like a citizen’s-initiated trial. "The real issue for you is population balance. And as much as those of us who cast the votes, do the interest-oriented politics, and make the coalitions would like you to address power and politics, you really can’t do that. That disappoints me because I have certain things I’d like you to support. "But your real charge is population balance. The map of Trial E does the least damage to the fewest neighborhoods, and balances the population most simply." "My name is Dan Cullimore. I reside at...Given that my neighborhood, North Central Columbia, is wholly within the proposed TIF District, and that some of the proposed projects will have a direct impact on my neighborhood, I respectfully ask Council to establish, prior to committing to any financial mechanism, the recommended neighborhood planning process [in the Columbia Imagined Visioning guide] for mine and all neighborhoods that will be affected by TIF-financed projects." Dan Cullimore stated his support for the suggestion of Councilman Thomas to reduce the number of green trash bags distributed. He recommended the City partner with neighborhood associations in terms of solid waste and other budget issues. He commented that neighborhood groups had a wealth of ideas that were not being tapped. Dan Cullimore explained he was the Project Manager for the renovation of the Heibel-March Building and Vice President and Secretary of the North Central Columbia Neighborhood Association. He noted the building remained in need of renovation. In January, his group hired Columbia Associates Architects and CM Engineering. The construction documents were now complete and they applied for a building permit. They also secured help from many other people and groups. The Sheet Metal Workers of Local #36 pledged their labor to install the heating, ventilation and air conditioning systems. The Director of the Convention and Visitors Bureau offered to help market any tax credits they would receive. Job Point’s Youth Build students removed damaged plaster and old plumbing and heating electrical fixtures. Koonse Glass replaced the broken windows. Cullimore said they hoped to create a multi-purpose space for community groups, social service agencies, Field Elementary School, senior and youth service organizations. Dan Cullimore, the president of the North Central Columbia Neighborhood Association (NCCNA), pointed out he had not received notice of possibly removing parking on Fay Street. He would have attempted to initiate a conversation with the neighbors and neighborhood businesses likely affected had he received notification, so the NCCNA could have taken a position on this issue. Mr. Cullimore commented that NCCNA valued their business neighbors and had defended parking for Orr Street businesses in the past. He asked Council to direct the City Manager to ensure proper notification of items such as planning meetings and code amendments. He felt each City department should create an effective notification system. Dan Cullimore commented that funding of the Discovery Drive project at this time was a clear example of misplaced priorities. It was heavily weighted toward economic development when there was a need to address the issues of regular homeowners. The policies and practices unequally advantaged new development while disadvantaging those in older neighborhoods. He commented that Twin Lakes had been closed due to excessive levels of E-coli, and wondered if it was a result of the sanitary sewer problems along Again Street. Mr. Cullimore stated he believed the first priority of the Council should be the protection of public health and welfare. "Dan Cullimore, 715 [street address required of speakers]. I don’t often find myself agreeing with [commercial Realtor] Paul Land. But I think his request for extensions of the six month period is probably reasonable for many properties. Likewise, with the request for longer than three years for industrial properties, I think that is probably reasonable. "I have a concern about where a tiny house might fit into the permitted uses and on what sort of property. "Tiny houses are used in many communities to address homelessness and affordability. And yet as I look at these tables for dimensional standards and permitted uses, I don’t see anywhere in Columbia where we could do that." 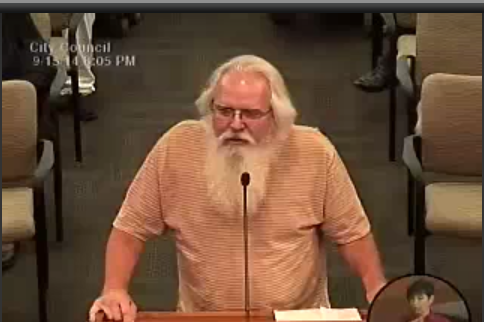 Dan Cullimore, 715...encouraged the Council to support this proposal. He believed Columbia would need to find ways to incentivize conservation as it looked at its energy future. Dan Cullimore, NCCNA president, said NCCNA benefited from the bike boulevard at Windsor Street and Ash Street. But he encouraged the Council to pay attention to the concerns of the Park Hill Neighborhood Association, and thought it wise to complete and assess this project incrementally. While NCCNA had seen considerable benefit from the existing bike boulevard, he felt the proposed bike boulevard was considerably larger and demanded greater scrutiny. Dan Cullimore, 715...reminded the Council that the plans for most single family housing in Columbia were never reviewed prior to construction. The City does not review building construction plans so there is no way to intervene beforehand. Inspections occur during construction for footings, foundations, structure, etc. He commented that he did not know of a solution to the foundation insulation problem. He said it involved two important items, the future of energy consumption and the soundness of people’s homes. He thought it deserved more deliberation than would happen tonight. Dan Cullimore asked the Council to keep in mind assumptions matter when considering the new residential building code. Methods for calculating cost-benefit figures employ many strategies, such as simple payback formulas, cash flow analyses, net present value, internal rate of return, and return on investment. Dan Cullimore, President of NCCNA, urged the Council approve the waiver of fees...to encourage low-income homeowners to downzone their properties. Most properties in the central city had been blanket upzoned by Council action without a request of previous property owners, he said. Dan Cullimore, 715...stated he was speaking tonight as President of the Board of Directors of the Columbia/Boone County Community Garden Coalition. He explained they were largely funded by a social services grant from the City of Columbia. He noted they were developing a grant proposal, and asked if funding for social services programs had changed from previous years. City Manager Matthes replied it had not changed. Councilman Skala thought it was around $900,000. Mr. Matthes stated the Health and Human Services Department purchased services with a little under $900,000. The C.A.R.E. program had about another $400,000. Mr. Cullimore thanked them for the information, which would help his group structure their ask. He explained the number of people they served had increased, and they had some specific issues that previously had not existed, such as communication with non-English speaking residents. A search of City Hall meeting minutes suggests the 2017 budget hearing may have been the last time Dan testified. He left Columbia a model of optimistic yet pragmatic community involvement for generations to come.